‘On 25 April 1945, so the story goes, a group of battle-weary Russian soldiers were making their cautious way through the shattered remnants of Berlin, mopping up the isolated pockets of German resistance that remained in the heart of the Third Reich. The soldiers moved carefully from one wrecked building to another, in a state of constant readiness against the threat of ambush. This article is designed to be provocative and break the boundaries of convenient and accepted ‘taboos’ with regards to the country of Tibet, the Buddhist culture of Tibet, and the ethnic groupings that comprise the people of Tibet. What this article is not – is an attack on Tibet, its Buddhism, or its culture. It is a presentation of the numerous and extensive misconceptions that surround the ‘concept of Tibet’ as it exists in the contemporary Western mind, and which in that respect has very little to do with the actual ‘Tibet’ that exists in the snow covered Himalayas. Much of this unreal and mystified Tibet has arisen from the pen of the British plumber who never once visited Tibet, but who nevertheless, imagined himself to be a born again Tibetan Lama. This was Cyril Henry Hoskin (1910-1981), also widely known as Tuesday Lobsang Rampa, although he had other names. The 14th Dalai Lama stated publically that Hoskin’s work had little to do with real Tibetan culture (or Buddhist practice), but admitted that it had served a positive purpose for publicising the Tibetan cause in the West. This type of situation (that involves contradictory statements and makes use of sentimentalist assessments that ignore historical fact as a means to establish a propaganda presence in the imagination of the West), is demonstrative of the logical ‘fault line’ that runs directly through the Tibetan issue as it exists in the West at the present time. The Tibetan freedom movement has painted itself into a political and conceptual corner in the West. Not only this, but the Western misconceptions about Tibet have also seeped through into the minds of impressionable young Tibetans living outside of Tibet, and are dependent upon material aid from governments and agencies that are a priori hostile to mainland China. The imaginations of the Western mind are being played-out on a geo-political battlefield that sees Tibet, her culture and her Buddhism fundamentally distorted, misrepresented, and sanitised to fit into a narrow Eurocentric bias that displays anti-Chinese racism as a legitimate form of protest. This anti-Chinese racism has been taken on by many Tibetans and deployed liberally through their advertising campaigns and interactions with others. Ironically, it was exactly the same Eurocentric racism that justified the British invasion of Tibet in 1903, only that time it was the Tibetans themselves who were on the receiving end. For Tibet to be ‘free’, it must first free itself of the multitudinous and systemic misrepresentations that it suffers at the hands of Western commentators, supporters, and supposed friends, who are using the Tibetan issue to continue a vicious anti-Chinese campaign of racism that is disguised behind a thin veneer of a political campaign that claims to be trying to ‘free’ Tibet. This article suggests that Tibet has to be freed from the physical and psychological traps of Western generated discourses that simultaneously ‘distort’ as they ‘represent’, and that only a Tibet free of ‘Orientalism’ can truly campaign for a legitimate political and cultural independence that asserts the genuine ‘Asian-ness’ of the Tibetan people and abandons the narrative of Western racism aimed at China supposedly on behalf of Tibet. For Tibet to be free, it must acknowledge that as an Asian country that has shared thousands of years of cultural interaction with China, it has more in common with its Asian neighbour than it does with the United States of America that is manipulating it for its own nefarious ends. Since the success of the Communist Revolution of 1949 in China, and the ousting (to Taiwan) of the US financed Nationalist regime under Chiang Kai-shek, Tibet has become an ideological battleground. The United States of America, utilising the Central Intelligence Agency (and other US governmental departments), chose to focus on the Tibetan geographical area, and initiated a neo-colonial policy of the de-stabilisation of Tibetan culture in general, and the disruption and deformation of Tibetan Buddhist practice inparticular. This was done as a means to establish US influence in the Tibetan area, and use this influence as a means to initiate a Western-led counter-revolution in the country of China. In other words, by arming otherwise pacifist Tibetan Buddhist monks (and in so doing encouraging a system-wide abandonment of the Buddhist morality against killing amongst the ordained Sangha), as well as encouraging the peasantry of Tibet to ‘rise-up’ armed only with farming implements or outdated weapons (forged on the feudal battlefield), Tibet as a country was thoroughly de-stabilised and plunged into a disastrous modern conflict with the contemporary military forces of the People’s Republic of China. The ‘myth’ of Tibetan ‘nationalism’ was born not from the minds of indigenous Tibetans, but rather from the pens of faceless US government employees, operating out of offices in Washington. This is the instigation of Western-style ‘nationalism’ in the land of Tibet, a form of political agitation otherwise unknown to the Tibetan people. An important aspect of this US-led ‘nationalism’ was the importation of Eurocentric racism into the Tibetan cause. The Tibetans were given rudimentary support from the US (and India) in return for their rejection of Chinese rule, and the ‘racialization’ of the Chinese people. This is why much of the pro-Tibetan sentiment in the West (and the East) is racialist in nature, and premised not on the objective study and assessment of history and historical relations between Tibet and China, but rather upon the US (and Eurocentric) assumption that the Chinese skin-colour automatically equates with Chinese culture being inferior, redundant, corrupt, and dysfunctional. The US association with Tibet is nothing more than a neo-colonial project that perpetuates the attitudes associated with Eurocentric imperialism evident in the 18th and 19th centuries, and has nothing to do with the notion of Tibetan freedom. The notion of ‘Tibetan freedom’ serves as a smokescreen for the perpetuation and continuation of Western racism in Asia. Tibetan history, of course, records that Tibet was once a mighty warrior nation that built itself an empire entirely through military victory and conquest. Part of this empire included large swathes of what is today geographically known as western China. Eventually, the military forces of various Chinese dynasties pushed the Tibetans out of China and spread Chinese imperial rule in Tibet. 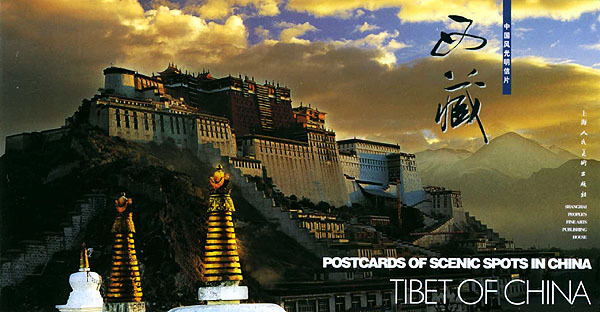 Like many countries in the world, Tibet has benefitted from its own colonial expansion, and suffered from the colonial expansion of China in return. However, it is important to note that under the Qing Dynasty (1644-1911), Tibet was considered part of the Chinese empire and the West had nothing to say on the matter. During the (Western supported) Nationalist government of China (1912-1949), Tibet was part of the Chinese nation, and the West had nothing to say. With the victory of Mao Zedong and the Communist regime (in 1949 to present), Tibet remained part of the Chinese nation – and the US (and its Western allies) vehemently protested, whilst simultaneously forging ever closer trading and political links with China. This has led to the Hollywood film industry re-writing history with films such as ‘Seven Years in Tibet’ (1997), which portrays (with the usual and extensive artistic licence) the experiences of the German explorer (who was an ardent supporter of Adolf Hitler and a prominent member of the German Nazi Party) Heinrich Harrer (1912-2006). After escaping from a British Prisoner of War camp in India, he eventually makes his way on foot to Tibet, and this film offers his reminiscences. Instead of Harrer being treated as a former member of a murderous Nazi regime that exterminated 6 million Jews in extermination camps in Europe, as well as hundreds of thousands of Romany, disabled, and homosexual people (not to mention the 30 million men, women and children killed by German military forces in the USSR during WWII), he is presented to a contemporary Western audience as something of a liberal freedom fighter who only ever had Tibet’s best interests at heart. This is despite the fact that Adolf Hitler viewed the Tibetans as an inferior race of people, and sent numerous Nazi expeditions to Tibet to ‘scientifically’ prove this assertion, whilst searching for evidence of the presence so-called ‘German’ ancestry in the area. In his later life, as he began to make money with his memoirs through the pro-Tibetan movement in the West, he stated that his joining of the German Nazi SS (holding the rank of sergeant) as soon as Austria and Germany were united through military annexation in 1938 – was a ‘mistake’. To date, Harrer’s involvement with the German Nazi SS has not been subjected to the kind of scrutiny usually expected of an ex-member of a murderous regime that nearly succeeded in wiping Western liberal democracy off the map. This is the kind of man that the US-backed pro-Tibetan lobby in the West is prepared to eulogise and advise its young people and citizenry at large, to listen to and learn from. This apparent and intimate association between Tibet and the murderous far-right regime of Adolf Hitler appears to be the impetus behind the enduring myth of Tibetan men joining Nazi German military units and dying in the rubble of Berlin in 1945, whilst trying unsuccessfully to stem the tide of the Soviet onslaught with a mixture of bizarre magical rituals (which involved acts of suicide) and bullets. Coupled with the US-led political disinformation and misinformation about Tibet, has been the tendency for the Western creation of imagined narratives and pseudo-history that ‘mystifies’ Tibetan history and culture, whilst also depicting Tibet as a ‘pure’ state that is continuously the victims of the aggression of others. This ‘ahistorical’ approach is in fact a form of Eurocentric racism that completely ignores the true ‘Tibetan’ history of Tibet, and instead replaces it with what is in essence a secular re-working of the Judeo-Christian view of the world. In all the sentimentalising, re-imagining, and re-inventing of a peculiarly ‘Western’ vision of Tibet – Tibet itself is completely missing. In reality, Tibet is no different to any other nation on earth with its cultural distinctiveness notwithstanding. Tibet is a country of people with diverse genetic origin, cultures, and distinct religious practices – not everyone in Tibet is anti-Chinese or ‘Buddhist’, and not every sect of Tibetan Buddhism has the Dalai Lama as its head, and many people still living in Tibet do not view the Dalai Lama as the spiritual or temporal leader of their country. It is only in the disinformation of the USA, and the imagination of the West, that the Dalai Lama is the ‘leader’ of Tibet. In fact the Dalai Lama is only the acknowledged leader of the ‘Gelug’ or ‘Yellow Hat’ sect of Tibetan Buddhism. Tibet has historically developed from disparate tribes into clans, communities, regions, and then a distinct ethnic group. It was not always Buddhist, but originally followed the Bon religion, and was renowned for being a vicious warrior-culture. The myth is, of course, is that Tibet became a paragon of peace-loving virtue after its embracing of Vajrayana Buddhism imported from India. An objective view of Tibetan history demonstrates that this is simply not true. In 1903 the British imperialists unleashed a military force of 10,000 Sikh and Ghurkha soldiers from Indian Territory into Tibet to enforce a trading treaty and a recognition of national boundaries. This action by the British Army was essentially intended as a ‘warning’ to Russia not to interfere with British expansionist policies in the area. This British force predictably swept away every military and physical barrier placed against it. The British troops were armed with modern rifles, artillery, and Maxim machine guns which inflicted horrendous casualties on the numerous Tibetan armies that confronted it. Throughout the entire campaign (the British withdrew from Tibet in September of 1904), the British lost around 200 men, whilst the Tibetans lost an estimated 2000 – 3000. The 13th Dalai Lama first fled to Mongolia and then to China for protection, whilst his people suffered under the imperialist yoke. The Tibetan soldiers used either traditional bladed or bludgeoning weapons, together with armour and shields, as well as antiquated flintlock muskets – all of which was completely ineffective against the British fire-power. British reports suggests that Tibetan soldiers were given amulets ‘blessed’ by Buddhist monks (lamas) that purportedly offered ‘protection’ in combat from enemy fire. Many of the surviving Tibetan troops were seen looking at their amulets with a sense of confusion and desperation. Part of the ‘unequal’ treaty enforced upon Tibet by the British was the stipulation that Tibet had no further relations with any other foreign power. This effectively reduced Tibet (then a part of Imperial China), to the status of a British ‘protectorate’. This is probably the ‘legal’ root of the modern Tibetan independence movement. Despite this imperialist flexing of muscle, however, the British quickly withdrew from Tibet as they feared a Chinese military counter-strike. It was the British invasion of Tibet in 1903-04, and the subsequent destruction and defeat of the Tibetan armed forces, and the negating of its religious beliefs, that led to a sense of outrage and frustration throughout Tibet itself, and the Tibetan people living in the Sichuan and Yunnan areas of Western China. The Tibetan population of China was the product of the former Tibetan empire that had once expanded into, and then ‘annexed’ western China, but which was then allowed to remain in Chinese owned territory once Chinese sovereignty had been re-established in the area. Part of this Tibetan frustration involved a very strong sense of xenophobia (recorded as existing much earlier by other foreign explorers to Tibet), that emerged with extensive violence in the Yunnan province of China in 1905. The targets of this Tibetan ‘racism’ were all foreigners living in Yunnan, including Manchu’s, Han Chinese, Christian Westerners (i.e. French Missionaries), and their Tibetan Christian converts. Although administered by Chinese officials, the Yunnan area was known for its liberal attitudes toward its Tibetan population, and this allowed certain Tibetan Buddhist monks (i.e. lamas) to assume de facto political power, being allowed to do more or less what they wanted to do by the Chinese authorities. The Gelugpa Sect (led by the 13th Dalai Lama) initiated and guided the uprising that massacred the French Christian priests and 200 of their Tibetan converts. According to Western and Chinese records of the events, the 13th Dalai Lama ordered these Tibetan Christian converts to give-up their new faith and re-embrace Buddhism – when they refused – the 13th Dalai Lama ordered that they all be killed. This pattern was repeated all over Yunnan province, with Westerners, Tibetans, and Chinese victims being shot with poisonous arrows, beheaded with swords and even dismembered. The Qing Imperial Court sent armies under Generals Ma Weiqi, and Zhao Erleng to subdue the Tibetan threat in Sichuan, Yunnan, and parts of eastern Tibet. These military forces eventually prevailed and the Tibetan threats were defeated. All surviving lamas were executed by the Chinese authorities. After these events, the Tibetans lost all political privileges in the Chinese areas and Tibet proper. What is interesting about the description of these events as perpetuated by Tibetans, is that they demonstrate distinctly ‘non-Buddhist’ behaviour by the Tibetan Buddhist lamas themselves, and the lay Tibetan Buddhists. The Tibetan behaviour in Yunnan (and elsewhere in the region) is far removed from the Western misrepresentations and mystification of Tibet. If Tibet is wrongly viewed as ‘pure’ and ‘beyond worldly entanglements’ by a Judeo-Christian falsification, then the reading of true Tibetan history will be treated as an expression of ‘heresy’ and the conveyor of fact attacked as a ‘non-believer’ in the Tibetan myth. This is the situation with many modern Tibetans brought up either in India or the West, who are indoctrinated into this Western mystification of Tibetan history, and find themselves unwitting spoke-persons of it. This is complicated by the fact that the a priori anti-communist stance of the USA (which only supports the notion of Tibetan independence because it confronts and contradicts Chinese communist policy) has been shaken by the fact that the current 14th Dalai Lama has publically declared that he is a ‘Marxist’. This situation creates the quandary of a Tibet being ‘freed’ from Chinese Communist rule, to be replaced by an independent Tibet ruled by a Dalai Lama who is a committed Communist. Master Xu Yun (1840-1959) and Tibet 1911-12 https://thesanghakommune.wordpress.com/2015/01/24/master-xu-yun-and-tibet-1911-12/ Author. In Kalsang Norbu Gurung’s article ‘The role of Confucius in Bon Sources’ (Contemporary Visions in Tibetan Studies – Proceedings of the First International Seminar of Young Tibetanologist, Serindia, 2009, Pages 257-279), another Eurocentric myth about Tibet is revealed. Whereas Bonpo is perceived to be an indeginous religion of Tibet, Gurung’s research (from Tibetan language sources), reveals that the hagiography of the founder of that belief system (Shenrab Miwo) is heavily influenced by the Chinese sage Confucius – and that this influence dates from the 11th century CE, or the earliest known Tibetan texts containing biographies of Shenrab Miwo. Sherab’s artile is subtitled: ‘Kong tse and his attribution in the Ritual of Three-Headed Black man’. I shall write about this association shortly – probably for the ICBI Ejournal.